Our Asia economists write in their recent ‘Asia Special Report’ that they expect a decoupling from the Fed and no rate hikes until H2 2018. We have developed three proprietary tools to help improve our ability to forecast headline and core inflation for 10 Asian countries. One is a statistical method to estimate base effects, the second is our inflation pulses, essentially leading composite indexes of inflation comprising of upstream price indicators, and the third consists of more fundamental regression models of CPI and core inflation based on commodity prices, output gaps, effective exchange rates and country-specific factors. Exchange rates and commodity prices can have large swings, making them inherently difficult to forecast; in short, they are the two big wild cards in forecasting Asian inflation. We therefore present a matrix of scenarios to illustrate the sensitivity of each country’s CPI inflation to movements in exchange rates and commodity prices. We identify four countries – India, Indonesia, the Philippines and Singapore – that seem most exposed to large potential future moves in the exchange rate and/or oil prices. While useful, we are cognizant that empirical models have many limitations. 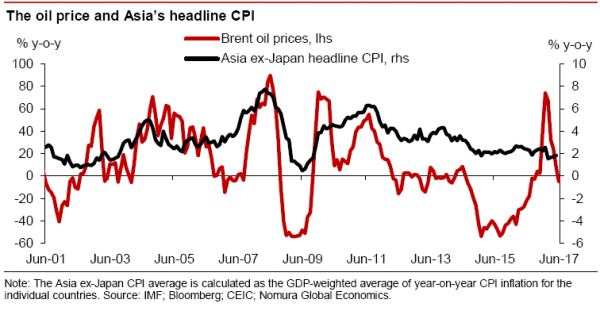 Therefore, in the final analysis Nomura's country economists take the empirical analysis on board but also consider a host of other local and practical factors to arrive at their CPI inflation forecasts, which are explained in detail in the individual country pages. In the short term (i.e. Q3 and Q4 2017) our forecasts paint a very benign inflation picture. The only country where CPI inflation is expected to rise noticeably is India – and yet from a very low level and driven mostly by food prices and base effects. In the medium term, we forecast CPI inflation to rise noticeably in 2018 in only two of the 10 countries – India and the Philippines. In Hong Kong and Korea we forecast modest rises in inflation, but from very low levels. In Indonesia, Singapore, and Thailand, we expect inflation to remain low and stable next year, especially core inflation. In China, and particularly Malaysia, we forecast both headline and core CPI inflation to fall in 2018. In line with our benign CPI inflation outlook we expect most Asian central banks to keep policy interest rates at their current historically low levels for a very long time. In fact, we do not expect any Asian central bank to hike this year, or in H1 2018 for that matter; only in H2 2018 do we expect the Bank of Korea and Bangko Sentral ng Pilipinas to start hiking rates. Even in 2019, we expect only these two central banks to hike rates. Our Asia interest rate forecasts imply a complete decoupling from the Fed, which is an extraordinary departure from past Fed hiking cycles. Interest rate strategy: We have a constructive bias on the front end of most Asian rates curves and our Economics team’s conclusion of a benign near-term inflation picture supports our general receive bias in front-end Asia rates. Low, or lower, inflation is one of the key reasons behind our constructive bias on front-end rates in Asia, along with stable monetary policy and, generally speaking, ample liquidity in the region’s banking systems. Indeed, it is worth noting that high real yields in Asia provide a decent cushion against the Fed and ECB policy normalization. To be clear, we do believe that the longer end of some of Asia’s low-yielding rates curves (like Thailand, Singapore, South Korea and Malaysia) are vulnerable to a rise in global yields, but even along these curves we expect the shorter end to remain relatively stable. Look to enter front-end bond positions in Indonesia (5yr). For further insights, see the full report here. Are striving tiger cubs the next phase of flying geese?